Premium Cotton Fabric: eco-friendly, comfortable, breathable, lightweight which brings different skin feeling and a nice sleep! 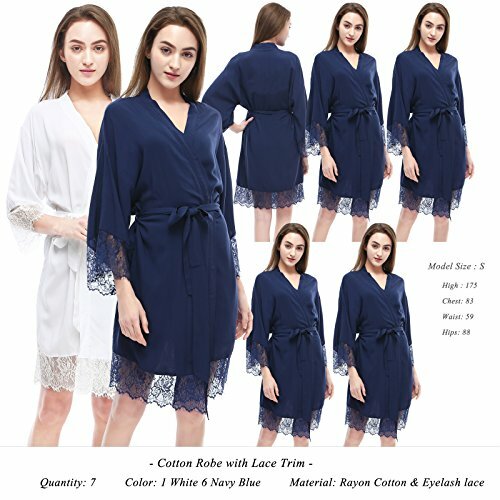 Lace Patchwork: Making some lace design on sleeping robe edges, which makes the solid color not too monotonous, bring some body line design, casual and loose fit. Occasions: Perfect gift for special someone for bridesmaid, bridal shower, wedding night and moms. And also in your daily use, stay warm while you rest in home! Size: S-XL, Please check sizing information to ensure your size prior to ordering. Detail Size information reference product description.